Why do I make paper? For me, it happens every spring when the stirrings of plants arouse a need to begin again a conversation with the earth. It is that time of year when I quicken my steps to my paper studio, open wide the studio doors, shed the winter plastic wrap on the windows, and let the fresh spring air course throughout. I defrost some of the frozen cornhusk pulp I gathered and cooked last fall and fill a vat with water. Soon, the pulpy mixture separates into ever smaller bits of cellulose fiber. I stir the vat; I feel the soft fullness return. The fibers begin to energize, cell walls fill with water, and my fingers spread their yellowed-green evenly in the water of the vat. In the summer, the conversation between hand and fiber continues in an adventure of exploration and discovery. It is an early morning walk on the beach, yellow pail in hand, that I find at the water’s edge the seaweed pinks, reds and, greens. I wade into the clear water to see how this floating seaweed garden displays. This watery view tells me how seaweed might behave when it is fiber bound. I scoop some into the pail and head back to the studio where I clean and sort seaweed before adding it to the pulpy mixture of the vat. This time I work with a blend of two fibers, soft cotton rag and abaca, a silky feeling, cream-colored pulp. This Phillipine banana leaf fiber, will add excellent tear strength—its strong voice—to my final paper art. And as my hands work the seaweed, stirring it into this fiber blend, I know the fibers will have their own say. I step back to play the role of observer and willing interpreter guided by the different characteristics of each fiber intensified by the preparation process. The fiber voices vary in shrinkage, translucency, strength, and color depending on whether the fiber is retted, cooked, hand or machine beaten, or any combination of processes. I begin to pull sheets of paper where fibers move in random assignment. I notice the way the fibers begin to hold together. An invisible hydrogen bonding starts to tighten and lock the physical mesh of these beaten fibers and seaweed surprises. This bond will continue through a light pressing. 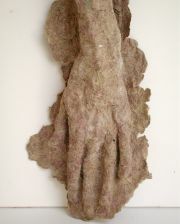 I lift and tear long, wet strips of firm fiber to press into a plaster mold of my hand. I apply methyl cellulose, a kind of wet glue, to the fiber strips with a brush and continue to cross layer wet strips and methyl cellulose, firmly pressing fiber into each plaster finger detail—long, thin fingers etched with lines, and fingertips outlined with short fingernails. When the entire plaster cast is filled with wet fiber, I set it aside to dry. It is at this point of contemplation and patience—the drying will take days— that I acknowledge the mystery of paper’s life as a physical substance. This substance has come full circle, from seed rooted in the earth to mature plant to renewal in another circle as paper art. Fortunately for me, I have had my hands in the stirring.